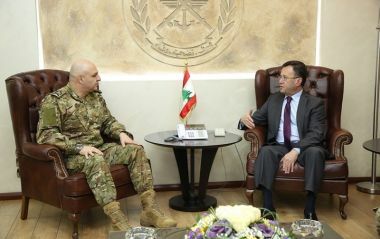 Lebanon - Army Commander General Joseph Aoun on Monday received at his Yarze office Armenia's Ambassador to Lebanon, Samvel Mkrtchian, with talks reportedly touching on the general situation in Lebanon and the broad region, in addition to cooperation relations between the armies of both countries. Maj. Gen. Aoun also met with UNIFIL commander in Lebanon, Major General Michael Beary, with whom he discussed the situation in south Litani sector and along the southern borders. The army commander also met with the Representative for the United Nations High Commissioner for Refugees in Lebanon, Mireille Girard, with talks touching on displaced Syrians' affairs.